This is the easiest and most delicious summer recipe. 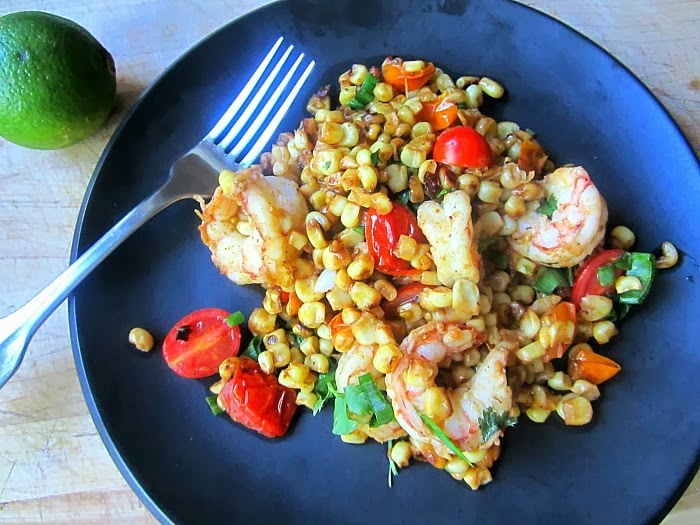 You will want to eat this every night for a week! It's best made with fresh Jersey corn, however, I have been known to use a bag of defrosted Trader Joe's white corn too. shhhh. I like to use my homegrown cherry tomatoes too. All made in one lovely, well seasoned, cast iron skillet. 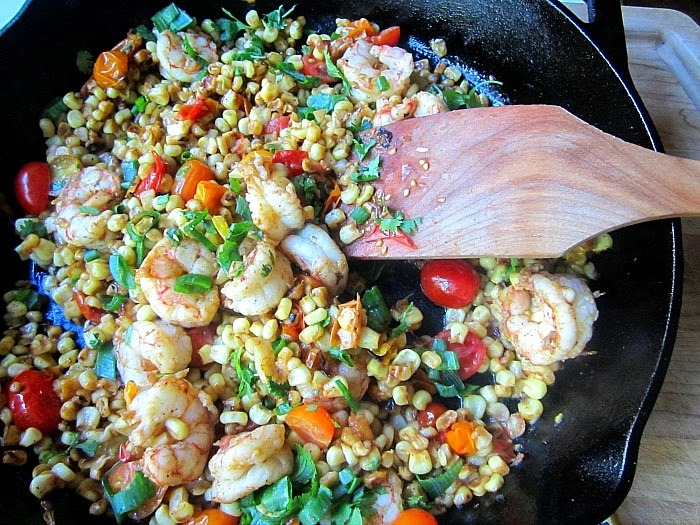 Heat the olive oil in a 12" cast iron skillet and cook the garlic 1 minute until fragrant. Next, lay the corn to cover the pan. Let cook for about 5 minutes, undisturbed, it will get a nice char. 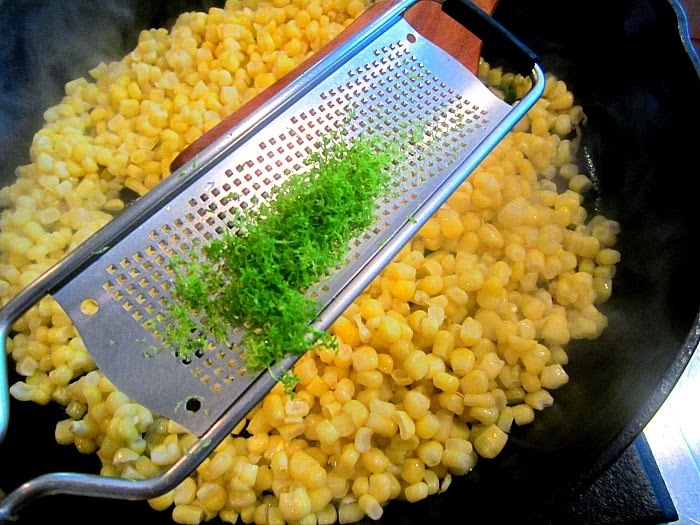 Move the corn around with a wooden spoon and add the chili powder, lime zest, cayenne and kosher salt. Let cook another 5 minutes. Add in the cherry tomatoes and cook 2 minutes or so. 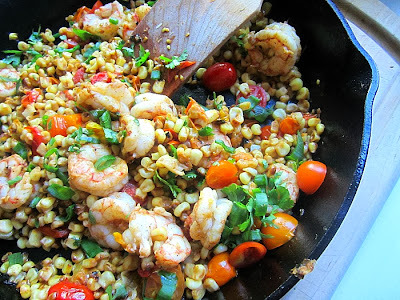 Push the corn (it should have a nice brown crust by now) and tomatoes to the side of the pan and add the shrimp. Let the shrimp cook a minute or two on each side, then toss everything together and squeeze in the lime juice. Add in the herbs and taste for seasonings. This is delicious served hot or cold! 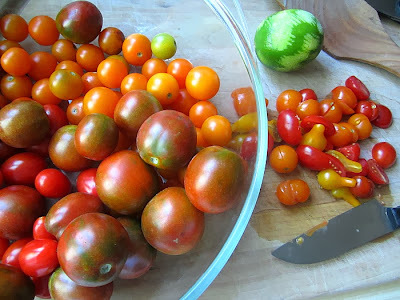 I starting to pick tomatoes, a few everyday, I want to make this for sure, looks great! Had this for dinner last night - with a little bit of rice pilaf on the side for my husband. He & my daughter asked me where I got the receipe, and I told them from Stacey Snacks - my husband said, "where????" Had to explain! Told them I've cooked many good meals from your site - thanks as always! This looks delicious AND so very pretty with the bright colors!!! I am going to make it tomorrow night….the list of ingredients does not say how many cherry tomatoes to use. From the photos, it doesn't look like very many so I think maybe 10-15, cut in half!